My questions regarding Palmer face paint, all started for me, when I asked for feedback on my "www.Face-Painting-Fun.com" website. I posted a thread in the facepainthq forum, asking for feedback from Face Painters, on the general content of my website. I was not expecting the anger of some pros regarding the fact that I was seen to be promoting Palmer face paint. I am responding to your concerns over the safety of Palmer’s Face Paint products. I have reviewed the blogging that you attached to your email. I found nothing specific except for a claim that our base is a latex used in house paint. This is untrue. The base for our face paint is a cosmetic grade resin approved for and used in many cosmetics. Our face paint has been tested and approved for use by the Consumer Products Safety Commission, tested by Duke University to meet the ASTM D-4236 standards for children’s paints and contains only FDA Cosmetic grade pigments. Although we have done everything in our power to make sure this product is safe for your children and ours (it was tested on the children of our staff), allergic reactions are always a possibility with any product and therefore we recommend testing before use. 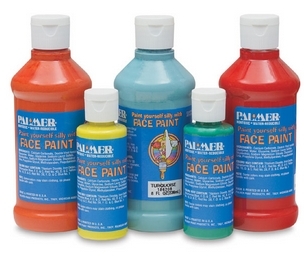 PALMER FACE PAINT PRODUCTS , INC. In conclusion then I will leave the debate over Palmer face paint to rage on. 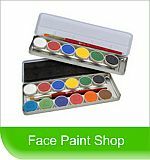 For me and my site I have not listed Palmer under the Brands of Pro face paints, since it has too many negative issues. 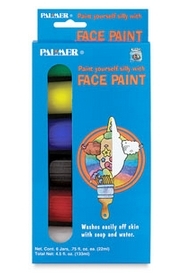 However, PALMER is still a major player in the face painting market (by sheer sales volume). It's advantage seems to be low cost, (for the home party & Halloween market) and disadvantage that most pros recommend rather, using professional grade paints. Also many of the pro's admit to having started their face painting journey, using such paint, but then quickly graduated onto the professional products due to a number of reasons. Personally I think that Palmer would be well advised to realize that the buying public in the information age, has more choice and is becoming more sophisticated, and thus should move with the market and introduce a quality professional grade product, and move away from the "craft paint" image of the past.